The brakes in your performance street or race car’s sole purpose is to convert energy into heat. Whether they’re stock or aftermarket, carbon, ceramic or iron. They create tremendous amounts of heat that are no match for aging, contaminated or even fresh OE style brake fluids. 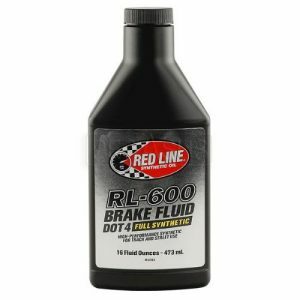 If you’re going through the hassle of rotor or pad upgrade, don’t skimp or choose the wrong brake fluid. This post won’t get into what brake fluid does or doesn’t do, there are hundreds of other sites and pages out there for that. We’re just going over why someone would need a high performance fluid, and cover some of the industry standard options. Brake fluids are advertised and chosen for their dry boiling points. Dry boiling points are the temperature the brake fluid will boil when new out of the bottle. Fluid boiling is the main culprit in brake fade and pedals going to the floor under hard braking, people confuse this with pad fade. Over time, glycol based fluids will wick moisture and humidity out of the air, it can absorb moisture through the vented reservoir cap, and even through the pores in rubber brake hoses. Because of this, fluids also have a wet boiling point, this is the term used when brake fluid has absorbed 3.7% moisture by volume, brake fluid can hold up to 13% moisture by volume if neglected long enough. If you do not change brake fluid regularly, the wet boiling point of the fluid becomes very important. If you remember back to your science and physics classes, fluids cannot be compressed, but gasses can. If your fluid has absorbed moisture, the moisture will turn to steam once the brakes heat up and exceed 100C, steam is a gas and can be compressed. That soft pedal feeling is caused by steam from your worn and contaminated brake fluid. Brake fluids are the least maintained fluid in a vehicle, if you have an older car, it’s likely the fluid hasn’t been changed in years, decades, or never. Flushing the system with new fluid could lead to a significant improvement in braking performance on track and on the street. Dry Boiling Point: Dry boiling point is the temperature that fresh DOT brake fluid will boil from an unopened container. DOT5: Silicone based fluid which can never be mixed with any other type of fluid. DOT5 is hydrophobic and will significantly reduce moisture and humidity absorption. It’s viscosity is significantly more stable over a wide temperature range. These fluids will not damage painted surfaces. But they can absorb air and should not be used in ABS systems due to aeration. DOT5 has a minimum dry boiling point of 500F (260C) and a wet boiling point of 356F (180C). DOT5.1: Developed due to the lack of DOT5 acceptance, DOT5.1 is primarily Glycol-Ether based retaining the performance advantages of DOT5 while being compatible with DOT3 and DOT4 Glycol-Ether based fluids. DOT5.1 has a minimum dry boiling point of 518F (270C) and a wet boiling point of 374F (190C). Hydrophobic: Literally means “water fearing”. The physical property of a molecule to repel water. A total lack of attraction to water. This is what causes oil and water not to mix. Hydroscopic: The opposite of hydrophobic, a hydroscopic molecule will attract and hold water molecules from it’s surrounding environment. Glycol-Esther fluids (except for DOT5) are hydroscopic, this is why they have a wet boiling point rating. They will pull moisture directly from the atmosphere, and must be stored in sealed containers. The standard in performance brake and clutch fluid. RBF600 is a DOT4, polyglycol-ether based that far exceeds FMVSS 116 DOT4, SAE J 1703 and ISO 4925 standards. RBF600 has a dry boiling point of 594F (312C) and a wet boiling point of 399F (204C). 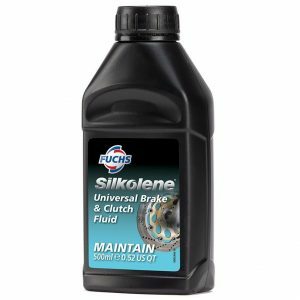 For use in all hydraulic clutch and brake systems requiring non silicone and non mineral based fluid. Exceeds conventional DOT5 and DOT5.1 performance, providing effective braking even under extreme conditions. This fluid isn’t compatible and should never be mixed with silicone or mineral based brake fluids. RBF600 is amber in color and will cause paint damage. Picking up where RBF600 left off, RBF660 is a DOT4, polyglycol-ether based clutch and brake fluid with a dry boiling point of 622F (328C) and a wet boiling point of 399F (204C). For use in all hydraulic clutch and brake systems requiring non silicone and non mineral based fluid. Mixable and blendable with all known DOT3, DOT4 and DOT5.1 fluids. Designed around the requirements of carbon and ceramic racing brake systems, or other systems with limited air flow or brake cooling. Exceeds FMVSS 116 DOT4 and SAE J1703. Don’t be confused (like we and everyone else were at first), this is not a silicone based DOT5. 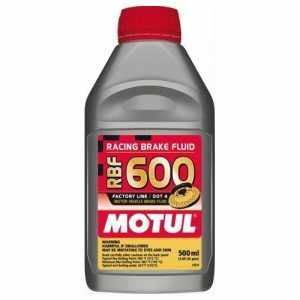 While still being far superior to and exceeding all DOT3 and DOT4 specifications, this is actually a step down from RBF600 and RBF660, it’s also Motul’s lowest price fluid. A polyglycol-ether based DOT5.1 synthetic clutch and brake fluid that IS compatible with DOT3 and DOT4 fluids. DOT5.1 has a dry boiling point of 516F (272C) and a wet boiling point of 369F (187C). For use in all hydraulic clutch and brake systems requiring non silicone and non mineral based fluid. 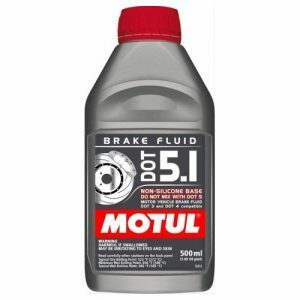 Motul claims this fluid was specifically designed for late model, ABS braking systems with a lower viscosity than DOT3 and DOT4 allowing easier fluid circulation in micro-valves and ABS valve block systems. Perfectly neutral with seals and materials in all modern ABS systems. DOT5.1 is yellow in color, will absorb moisture and must be stored in a tightly closed container. Exceeds FMVSS 116 DOT 5.1 non-silicone base, DOT3 and DOT4 SAE J 1703 and ISO 4925 (3, 4 & 5.1). Havoc Speed does not carry this fluid at the moment, it’s something we will in the future, and is definitely worth mentioning. 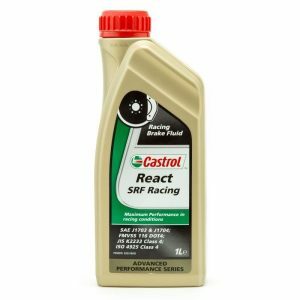 Castrol SRF is arguably the best fluid on the market. At 3x the cost of the other options, Castrol is awfully proud of it. SRF is used throughout Formula 1, Grand Prix and Superbike racing. SRF is a polyglycol-ether based DOT4 fluid compatible with all DOT3, DOT4, and DOT5.1 fluids. With a dry boiling point of 590F (310C) on par with the other fluids, it excels with a 518F (270C) wet boiling point. Even as the fluid wears and collects moisture it exceeds the boiling point of DOT5 making this exceptionally resistant to vapor lock in all conditions. It’s compatible with all ABS systems, and all seals, rubber and materials used in braking systems designed for conventional polyglycol brake fluids. Exceeds US FMVSS 116 DOT3 and DOT4, SAE J1703, ISO 4925 and Australian standard 1960 Grade 3. Pagid RBF is another fluid we do not carry at this moment, but we plan to in the future. This is another polyglycol-ether based DOT4 fluids, it is compatible and blend-able with all DOT3, DOT4 and DOT5.1 brake fluids. 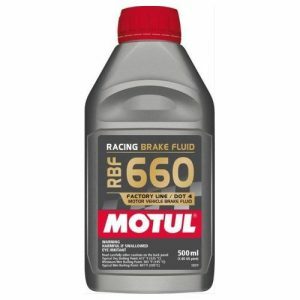 Along with Motul RBF660, it has one of the highest advertised dry boiling points out there at 626F (330C) and an average wet boiling point of 392F (200C). This fluid is yellow in color and fully compatible with all ABS systems. 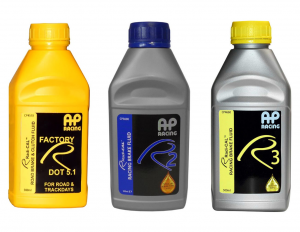 AP Racing has a line of quality fluids that we don’t carry, and likely won’t in the future. This isn’t stated or implied by AP or Motul anywhere, but I’m personally convinced the AP line of fluids are the Motul products listed above, I have no hard facts to back this up and I could be wrong. The properties, color, and boiling points are nearly identical to Motuls 5.1, RBF600 and RBF660 fluids, the names/designations are similar and other than the color, the bottles are exactly the same too. If this isn’t correct and AP want’s to reach out, we’d be happy to correct this. AP R2 CP3-600 is a polyglycol-ether based DOT4 fluid with a dry boiling point of 594F (312C) and a wet boiling point of 399F (204C). There are a couple other fluids not mentioned here, Wilwood has their own, Millers, and another company which has slipped my mind. I couldn’t find much info on them, they’re pretty hard to find, and a little redundant with the easily sourced options presented above. If you’ve read this far, still have questions, or are feeling exceptionally nerdy, jump over to the brake fluid section in the BITOG forum.